When you think of famous trailblazers, who come to mind? Lewis and Clark? Daniel Boone? The Franklin Elks? Armed with their gear and an Elks National Foundation Beacon Grant, members of Franklin, N.H., Lodge No. 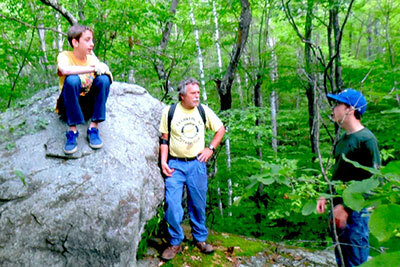 1280 partnered with local Boy Scouts and mapped hiking trails throughout the Great Gains Memorial Forest in Franklin, N.H. The Elks and the scouts headed out into the wilderness, cleared two trails, and built two bridges and a picnic table. To encourage all kinds of exercise, the Elks and their new partners are working year-round to finish walking, biking, mountain biking and cross-country skiing trails. And that’s only Stage 1. The Elks anticipate that the entire project will take four to five years to complete. With the support of the ENF Beacon Grant, they are looking forward to working with the Boy Scouts every step of the way.